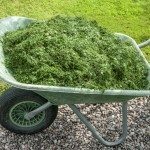 Can I use my grass clippings for mulch even though I have a lot of weeds in my lawn? I don't use and pesticides or fertilizers on my lawn... so there are a variety of weeds. When mowed, it looks fine to me, green. I have read that you can use the grass clippings as mulch, spread thin on the garden. I also read not to use grass that has been treated with herbicides. So then, how to you get clippings with no weeds in it?